Built at an amazing cost of cool Rs 1.5 million, the Jagdish Temple is a legacy of Maharana Jagat Singh to the city of Udaipur. The temple is dedicated to Lord Jagannath (incarnation of Lord Vishnu, the Preserver of the Universe), and is inside the City Palace complex. The temple is built in Indo - Aryan style of architecture. It is the largest temple in Udaipur. 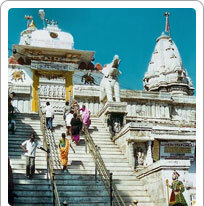 The three storied temple has a spire that reaches into the skyline of Udaipur at a height of 79 feet. The spire is decorated with sculptures of dancers, elephants, horsemen and musicians. Two massive stone elephants guard the gates of the temple. The temple itself is located at a height and is accessible climbing a long flight of steps. The serene image of Lord Vishnu enshrined here is carved out of single slab of black stone. The first and the second levels of the temple have fifty pillars each, all decorated with intricate carvings. A huge brass image of Garuda, the vehicle of Lord Vishnu can also be found here at the temple. This is a living temple with devotees coming from far and near and is also a big draw with the tourists for its beauty and serenity.